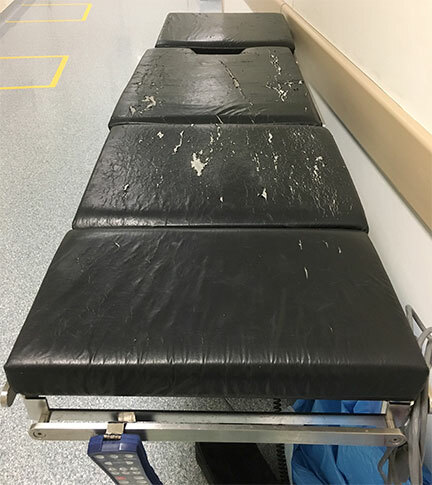 Recent Posts What are the biggest hazards to your surgical table or stretcher mattresses? Do you know what the biggest hazards to your patients are when it comes to surgical table or stretcher mattresses? Here at Meditek, we’ve been working with stretcher and surgical table mattresses ever since we opened the doors back in 1981. Granted, there are a ton of options out there for buying stretcher or surgery table mattresses and cushions, but beware of cutting costs as it could easily lead to higher replacement frequency as well as put patients’ safety at risk. Without further ado, here are the top four things you should look for when buying hospital cushions and mattresses. We’re all aware of the potential to acquire an infection from being in a hospital, and even moreso the cost that goes with it. That’s why our valued healthcare professionals rigorously clean equipment and areas between patient turnovers. But sometimes, no matter how meticulous the cleaning, there are conditions beyond our control. How do you know if your mattress is at risk of cross contamination? The very first thing to know is whether your mattress has welded seams or not. Welded mattress seams are the only way fluid contaminants will not enter the mattress via the seam. If you have stitched seams, you are at risk of having fluid contaminant ingress. According to a recent report from the ECRI titled the “Top 10 Health Technology Hazards for 2018”, a contaminated mattress or mattress cover is the third most hazardous health risk. 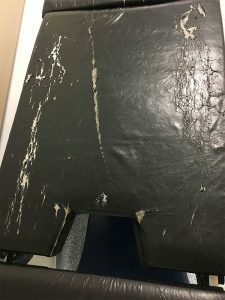 In the article, they describe how fluid contaminants can ooze out of the mattress or cushion and onto the patient or staff. The next thing to be aware of is the surface of the mattress. 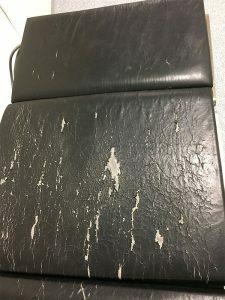 What condition is it in? Are there tears or rips? Is it punctured or cut? Even if you put a mattress cover over top of a torn mattress, there is still risk for ingress, as the cover itself may be worn or have a weak spot where fluids can get in. Ideally, and correct me if I’m wrong, you not would want your patients to develop pressure sores from laying on a mattress that bottoms out, correct? The first thing to ask yourself is for how long are patients spending on the stretcher or table? Are you an outpatient day surgery facility where the average time is a few hours? Or, is it an application where patients lay there for days? If bottoming out is a concern, you want to make sure that your mattresses have a denser bottom layer that is specifically designed to prevent bones from making contact with the hard surfaces below it. The ideal material is high-density, closed cell foam. The thickness of that bottom layer depends on the density. For example, if you have medium-density closed cell foam, you may want more overall thickness to compensate. Typically, for a high-density closed cell foam layer, you would need 0.25” bottom-layer thickness for it to be effective. What is the difference between 2-way stretch and 4-way stretch? 2-way stretch will stretch in only one direction. 4-way stretch will stretch in two directions. With the rigorous demands that a healthcare environment brings, it’s obvious which one is the better choice. Having a 2-way stretch will make your mattresses more susceptible to tears and damage. Our skin is sensitive, and while still quite durable, it can easily weaken under the right circumstances. What type of material does your mattress have as its surface? Better yet, what is the material that has direct contact with a patient’s skin? Is it a material that will sheer a patient’s skin when they move around? Or, does it possess anti-sheer properties. Meditek has been providing healthcare facilities across North America with hospital cushions and mattresses since 1981. We carry two main types – standard and Sof-Care. Our mattresses and cushions come with welded seams, 4-way stretch, high density closed cell technology, and anti-sheer surface. Our manufacturing capabilities extend across all surgical table, stretcher and bed brands and models. Contact us today for your mattress or cushion quote. 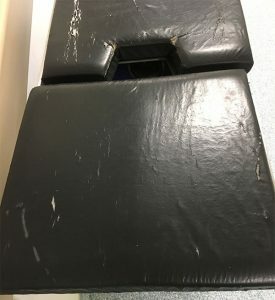 I’m looking for a mattress to fit an old table we have in the surgery area. I will be in contact with you this morning about this.